How do you start to grow your audience online? When you want to launch a business there are many pieces of the puzzle to think about. For example, have you thought about branding, what your product looks like, who is going to buy it, where will you sell it, what will be the cost of creating it, what are you going to sell it for? All of these are necessary. However, one big mistake I see new entrepreneurs making is – they forget to start building an audience of their own. Imagine this scenario – you spend all your time creating a wonderful product – whether it is a service such as coaching or social media management – or it is a physical product such as soap or handbags. You are ready to launch your business into the market. You know that it will help or delight so many people once they have it. But on your first month of trading, you sell…. one. Or maybe two if you are lucky. What happened? Where are all the people who said they would love this product or service? The step you missed out on is building an audience. Focusing so much on creating the offering is great – but you have to have someone to buy when you are ready to sell. So how do you start to build an audience? Especially when you are trying to get your business offerings ‘just right’? 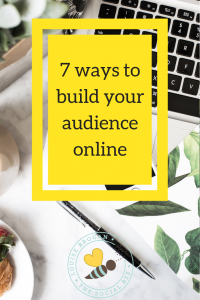 Here are seven ways to start growing your audience online today. Start showing up online. Join online communities where your ideal client hangs out – this could be Facebook Groups, LinkedIn chats or Twitter chats. Find your audience and start showing up where they are hanging out online. And don’t just show up – participate. If you are in a Facebook group, add value to people. What does that mean? When they ask questions, answer them. For example – if you are a website developer and your target audience are entrepreneurs. Inside a group such as the Social Beehive, the type of question that gets asked could be – how do I choose between Wix and WordPress? If you can help with this answer, you will be raising your profile as someone who knows about websites. If you continually show up as an expert in this field, members of that group will start to recognise you as the expert, and this will eventually lead to business. Post your own questions to start conversations. Being a member of a group is all about engagement – whether it is your own group or someone elses. Do be careful not to take over a group though. Ideally, you will be able to direct someone to a blog or video you have made that will answer their questions. This quick video will help you with your Facebook profile so that you can keep your privacy, but also allows people to find out what your business is and how they can connect with you. 2. Create a free download to share with your audience online. If your expertise is in personal shopping for example – why not create a one page ‘cheatsheet’ to winter fashion trends. Creating something that appeals to your audience is a great way to raise your visibility,and now you can start to collect people’s email addresses in exchange for something of value. This is called your opt-in. People will opt-in to your email list when you give them something interesting or valuable in return. Not all social media platforms will suit your business and your potential audience. Write down who you are trying to reach online. Then write down which social media platforms you think these people are hanging out on. Choose the top one. Focus on building an audience on one platform before you try to spend time on more than one! Remember not to build your whole business on someone else’s space on the internet. What does that mean? If you build up a large following on your Facebook page, and wake up one day to find out that Facebook have decided everyone needs to pay to see your content, you will have zero influence on that decision. But if you invite your online audience to join your email list, then you are able to email them directly whenever you want. If you are building a network on Instagram for example, one of the best ways to raise your visibility is by commenting on other Instagram business accounts. Not only will you attract the attention of the person who runs that account, but if you are posting relevant comments, then the people who follow that account will start to take notice of you as well! This applies to Twitter, LinkedIn, Facebook etc. What is your brand? what is your brand message? Be consistent with your social media platforms – if you are sharing tools and tips, stick with what is working. If you start creating live video once a week, stick with it. You will start to build an audience if they know you are going to deliver consistently. Always remember – your social media reach is determined by the social media platform to some extent. So start building your email list today, and you will start to build your business online. I can help you develop a strategy, plan and bespoke set of actions that will help you to build YOUR business online and start making sales this month.